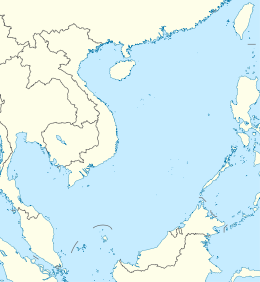 The Perhentian Islands (Malay: Kepulauan Perhentian) are islands in Besut District, Terengganu, Malaysia. The two main islands are Perhentian Besar ("Greater Perhentian") and Perhentian Kecil ("Lesser Perhentian"). The small, uninhabited islands of Susu Dara (Virgin Milk), Serengeh and Rawa lie off Kecil. Like Besut, people here generally speak Kelantanese Malay, however English is widely spoken and understood to accommodate the growing tourism market. The Perhentian Islands have become a popular travel destination for families and backpackers alike due to the many lodging options that accommodate almost any budget. The name "Perhentian" means "stopping point" in Malay, referring to the islands' traditional role as a waypoint for traders between Bangkok and Malaysia. The islands were sparsely inhabited by fishermen for centuries, although tourism now accounts for most economic activity. The Perhentian Islands appear on many maps of the nineteenth and twentieth century as 'The Station Islands'. This arises from the British colonial period, as an English translation of "stopping point". Pulau Perhentian was one of the islands where Vietnamese refugees or boat people landed during the 1970s. Nature tourism provides the economic base for the islands. Both the islands have palm-fringed white coral sand beaches (that can be tough on the feet) and turquoise blue sea. Popular tourist activities include scuba-diving, snorkeling, and swimming. On most beaches, the water is shallow with many rays, cuttlefish and parrotfish. For diving, there are dozens of dive sites around both main islands, as well as several off-shore sites. Apart from these, activities like camping, canoeing, fishing, jungle trekking, and banana boat riding are also available. The tropical waters around the Perhentians are clear with turquoise hues. The designated marine park in the island has corals and fish life is quite excellent. During peak season, the waters are calm which is excellent for learning to dive with one of the dive centres on the island. In contrast to the neighboring islands of Lang Tengah and Redang, the Perhentian islands have a wide assortment of accommodation, ranging from budget to mid-range. Most of the accommodation can be found on both the Perhentian Besar, the larger island and Perhentian Kecil, the smaller island. The Perhentian islands has a tropical climate with temperatures steadily around 30 °C and frequent but brief thunderstorms. A rise in tourism in Kuala Besar has led to the expansion of many different resorts and many options for snorkelers and divers alike. It is possible to get PADI certified at various locations and take advantage of the various wrecks and coral reefs. The Perhentian islands are home to numerous different species of monitor lizards, venomous spiders, and geckos. In the water and on the coral reefs, sea turtles, clownfish, cuttlefish, blue spotted rays, and black tipped sharks swim freely among many others. Except for two main islands of Perhentian Besar and Perhentian Kecil, there are five more islands in the archipelago. All these five islands are uninhabited. There are many snorkeling and scuba diving spots around it. The amazing sandy beaches are on Rawa, Serengeh and Tokong Burung islands. Ferries to both Perhentian islands leave almost every hour from Kuala Besut during regular business hours. Travellers from Kuala Lumpur or other destinations can fly, train, or bus to either Kuala Terengganu or Kota Bharu. From either town, the jetty port in Kuala Besut is accessible by taxi. It is also possible to use minivan services offered by various companies if travelling from Taman Negara, the Cameron Highlands, Kuala Lumpur or many other cities in Malaysia. The minivan services vary in prices and there are many different companies that offer service to and from various destinations. A ferry ride of approximately forty minutes can be arranged by one of the many jetty operators, or in cooperation with many of the resorts. Once on the island, there are limited trails that connect various resorts. A trail on Besar goes through the thick jungle, and some stretches of beach are home to various resorts so visitors can wander freely. The easiest way to travel around the islands is by water taxi, which can be arranged at most resorts. In the summer of 2007, two wind turbines were installed, although they were still not connected to the network as of August 2013, leaving diesel generators as the main source of the islands' electrical power. Electricity is available 24-hours during high season. Fresh water is provided by springs. Wifi is available on certain resorts but the connections can be limited due to weather conditions and electrical issues stemming from the isolation of the island. Resorts are attempting to remedy the troubles stemming from limited electricity and internet connections, it is important to visit each resort's website to be aware of the availability of these resources. The Perhentian Islands were once home to a significant green and hawksbill sea turtle nesting population. The Department of Fisheries runs a turtle hatchery on the islands to help address the declining turtle populations. Egg poaching from the beaches is a continuing problem. Wikimedia Commons has media related to Perhentian Islands. ^ "Photographs of the uninhabited Perhentian islands". Independent Travellers. independent-travellers.com. Retrieved 10 April 2014. ^ islandboy_jeff. "Van Transfer PerhentianIsland". Archived from the original on 23 April 2012. Retrieved 8 May 2015. ^ "Perhentian Island". Retrieved 8 May 2015. ^ "Explore Perhentian Islands on a next trip to Malaysia - Audley Travel". Audley Travel. Retrieved 8 May 2015. This page was last edited on 19 November 2018, at 20:13 (UTC).